As I prepare for the arrival of my new little one in July, I am always on the lookout for fun, new toys that I can give my baby to stimulate learning and creativity! Lamaze has two new Play & Grow toys that make perfect shower gifts. I can't wait to give them to my new baby so (s)he can begin an exploration into imaginative play. Plus, it's really reassuring to me that all Lamaze toys are developed in conjunction with child development experts. I love how it clips onto a stroller, car seat and more and makes different noises, textures, and colors! 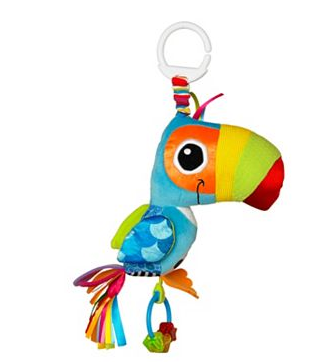 The purr-fect companion for your baby, Lamaze's Purring Percival is an activity toy designed to captivate, amuse, and engage your baby while stimulating their vision and hearing. Little ones will love exploring his bright colors, textures, and sounds.